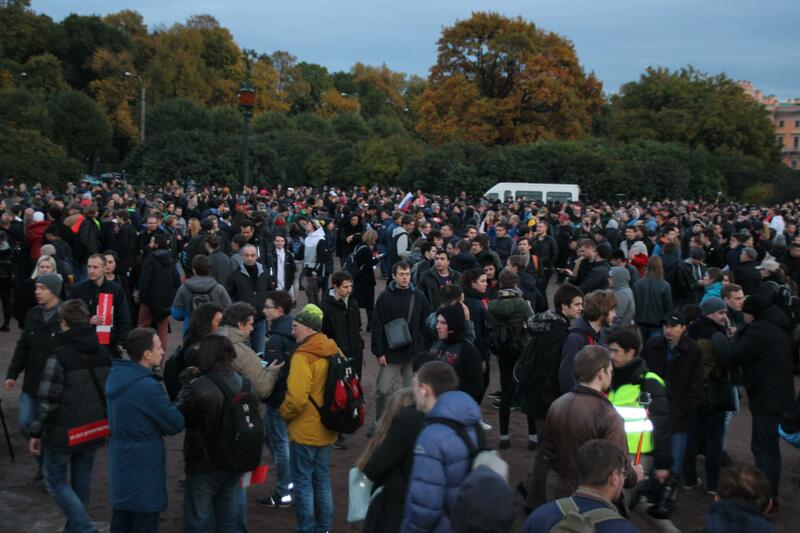 An unauthorized [sic] rally of Alexei Navalny’s supporters in Petersburg turned out to be an unexpectedly serious, well-attended event. Most supporters of the unregistered candidate for the Russian presidency had expected the rally to be poorly attended. A few days before the rally, workers were replacing gravel on the Field of Mars, the announced venue for the rally. 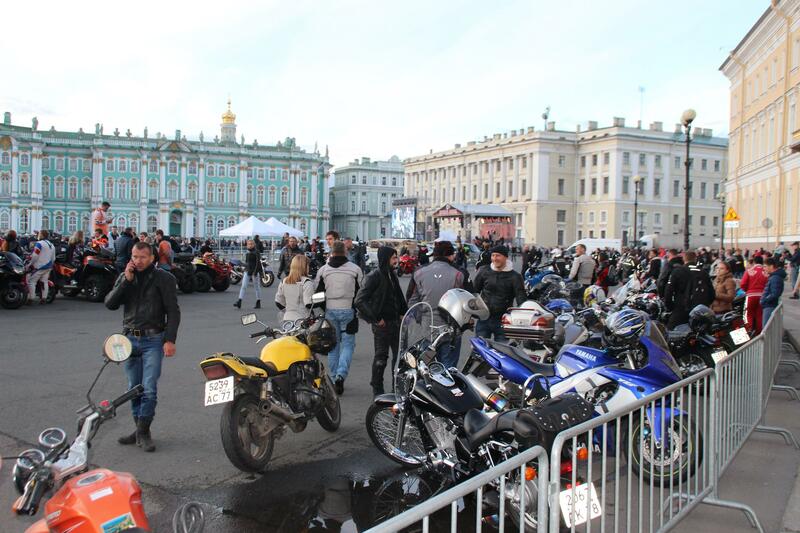 On Palace Square, a massive motorcycle rally, featuring the pro-regime motorcycle club Night Wolves, drew hundreds of bikers. In addition, on October 7, an “event whose purpose [was] to inform people about society’s complicated attitude towards the homeless, orphans, and HIV-infected people” had been authorized for the Field of Mars. 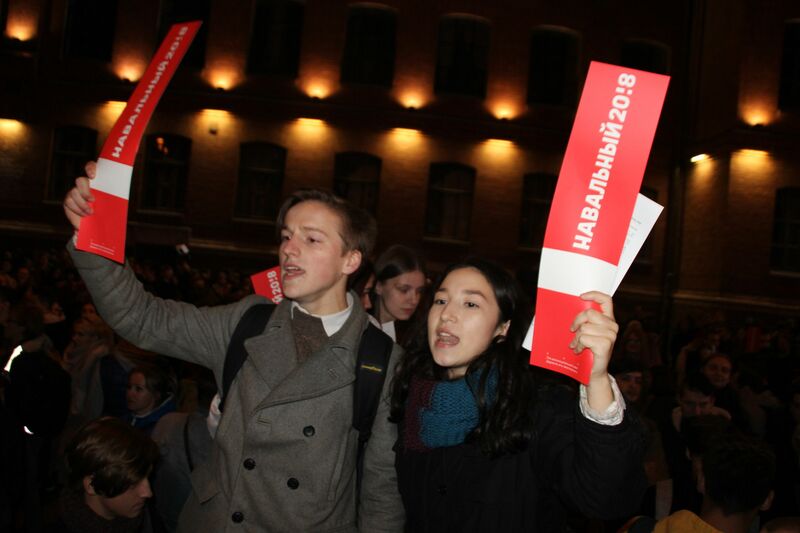 A few days earlier, on October 3, police had confiscated stickers promoting the rally at Navalny’s campaign office in Petersburg and detained local campaign coordinator Polina Kostyleva. Most of all, however, activists were amused to hear announcements, broadcast through a loudspeaker, inviting people to a free screening of the patriotic blockbuster Crimea at the nearby Rodina cinema. The oppositionists greeted the announcements with laughter. 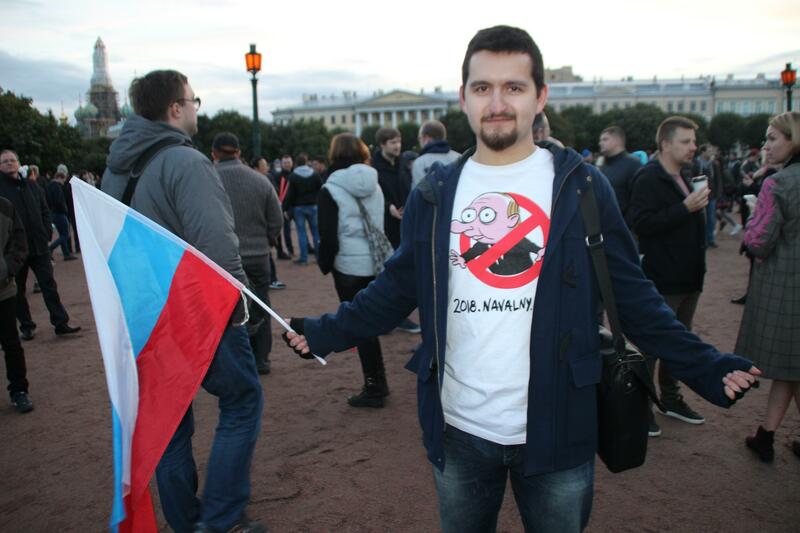 Navalny supporter holding the Russian flag and sporting a humorous “Navalny 2018” t-shirt on the Field of Mars in Petersburg, October 7, 2017. 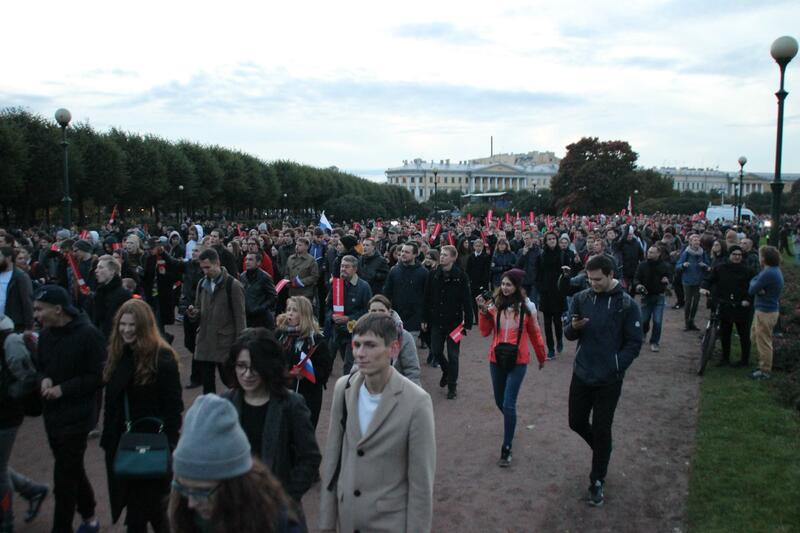 Navalny supporters and anti-Putin protesters milling about on the Field of Mars, Petersburg, October 7, 2017. 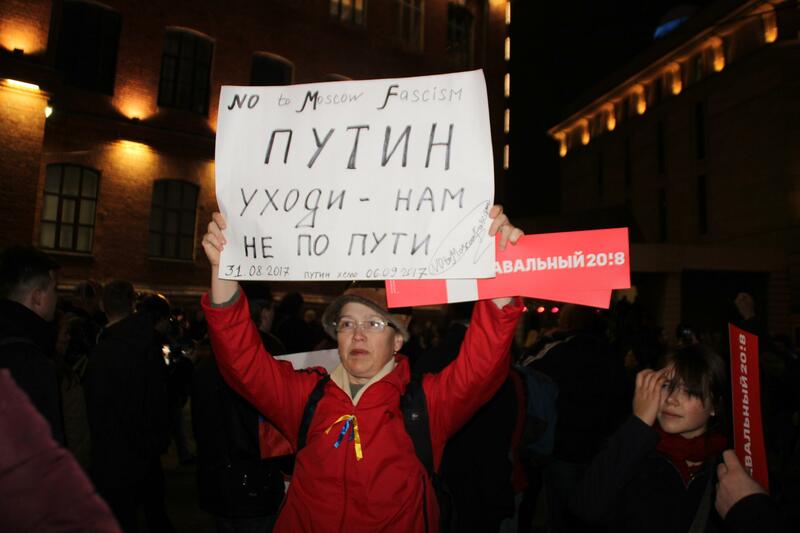 At 6:15 p.m., the people gathered on the Field of Mars chanted “Putin is a thief,” “Navalny,” “Freedom,” and even “Happy birthday!,” as the protest was timed to coincide wwith President Putin’s sixty-fifth birthday. On the Field of Mars itself, the protesters encountered no resistance from the numerous police officers on hand. They merely asked photographers to climb down from the walls of the memorial surrounding the eternal flame. Seemingly spontaneously, the crowd headed in the direction of Pestel Street. When the column of marchers spread out, it was obvious that no fewer than two or three thousand people were involved in the unauthorized [sic] march. Otherwise, it would be hard to explain how the rally attendees easily managed to stop traffic on Pestel and, subsequently, on Liteiny Avenue, one of the main thoroughfares in downtown Petersburg. The marchers chanted, “Down with the tsar!,” “Free Navalny!,” “We are the power here!,” “This is our city!,” and even “St. Isaac’s Cathedral is a museum!” An Interior Ministry press release would later claim that 1,800 protesters made it to Liteiny Avenue. Protesters abandoning the Field of Mars, where on June 12, 2017, around a thousand of their comrades were arrested for standing in place. 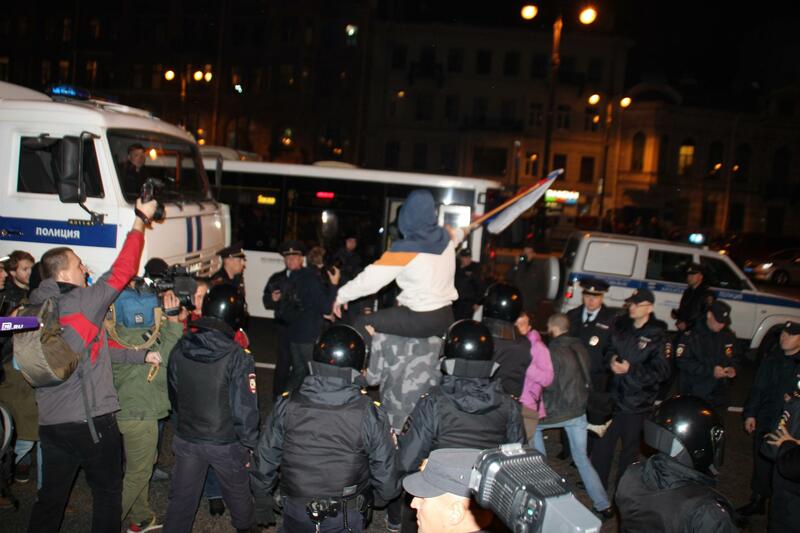 Police commenced to detain people roughly only at the intersection with Nekrasov Street. Police officers formed up in a line. Among the detaineed were well-known former political prisoner Ildar Dadin and photo journalist David Frenkel. Marina Bukina, an activist with the Detainees Support Group, was struck on the head by police. It has been reported that she suffered a concussion and had to have stitches. She was taken to St. Elizabeth’s Hospital. Polina Kostyleva, Navalny’s campaign manager in Petersburg, was once again detained by police. Georgy Alrubov, an employee of Navalny’s Anti-Corruption Foundation, reported his own arrest on Twitter. A number of bloggers have reported that Alrubov arrived on the Field of Mars only after most of the other protesters had left. Reporter David Frenkel during his arrest by police. He was later released from the paddy wagon. 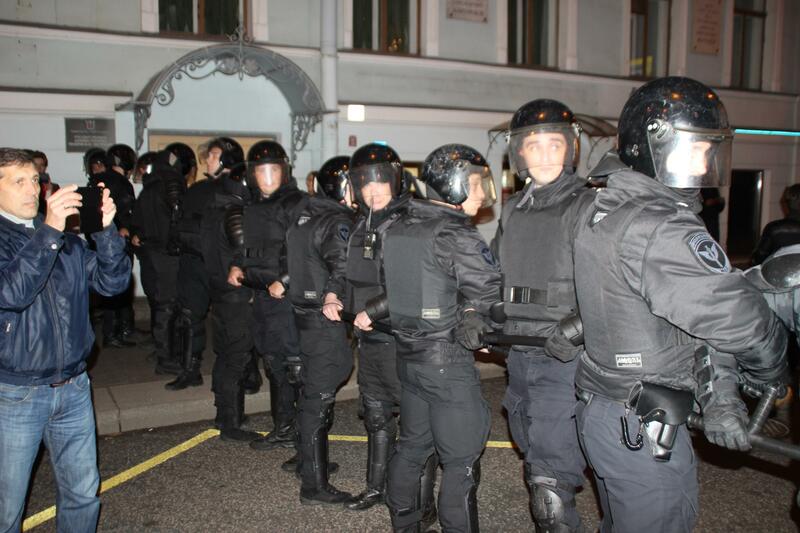 Nevertheless, the police line on Liteiny was unable to shut down the protest march completely. Activists bypassed the roadblock by taking side streets and regrouped on Insurrection Square on the plaza near the entrance to the Galereya shopping center. Several hundred people made it there. At approximately 8:05 p.m., announcements were made inside the shopping center that it was closing immediately due to “technical difficulties.” A mob of shoppers flooded out of the shopping center and mixed with the protesters. Maxim Reznik, an MP in the city’s Legislative Assembly, was on hand for the rally. “I gather that people headed spontaneously from the Field of Mars to Insurrection Square. This is the main problem, in fact. The regime itself has done everything it can to let the situation get out of control. Since they don’t allow people to assemble and arrest the organizers, people will take to the streets where they will,” the MP told Activatica. 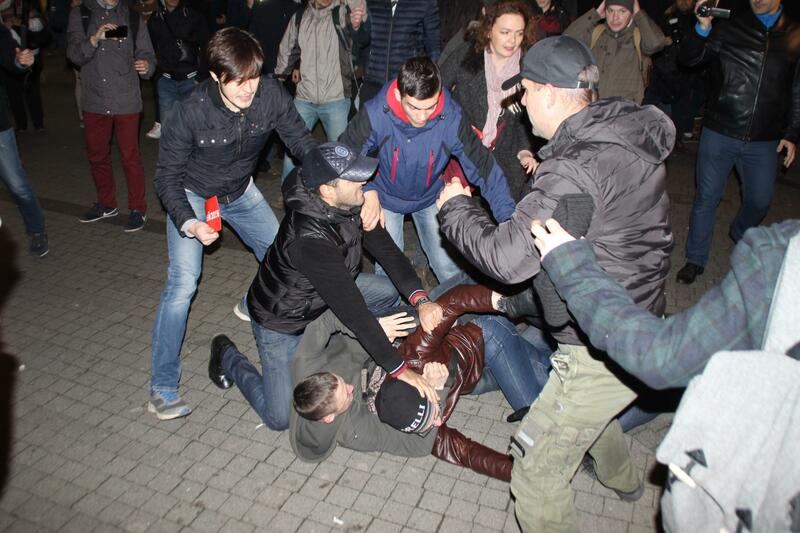 Fight outside Galereya shopping center between person unknown, some of whom were probably plainclothes policeman. Around 10 p.m, a group of protesters decided to assemble again, this time on Palace Square, where the concert portion of the motorcycle rally had wrapped up. Around a hundred people came to the square. There was a discussion on certain Telegram channels whether they should spend the night there. 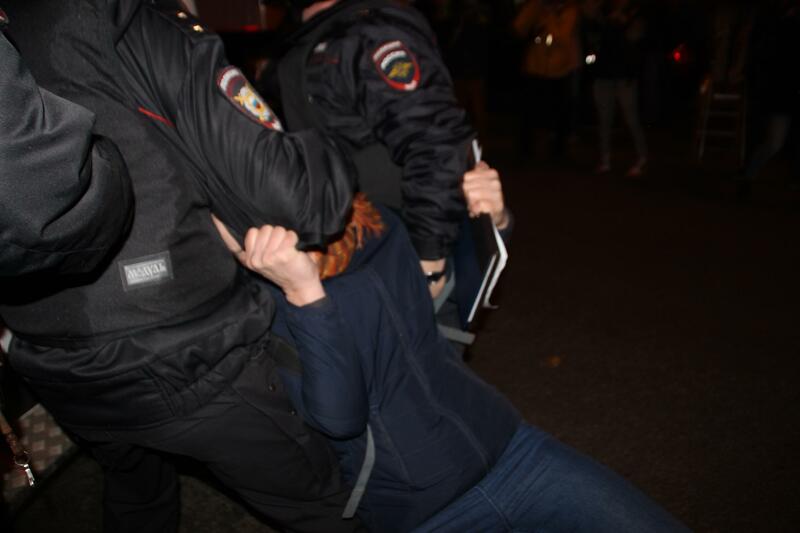 At least forty people were detained during the protests in Petersburg. Two workers in Navalny’s Petersburg campaign office who were detained at the protest have been fined 40,000 rubles each [approx. 585 euros]. 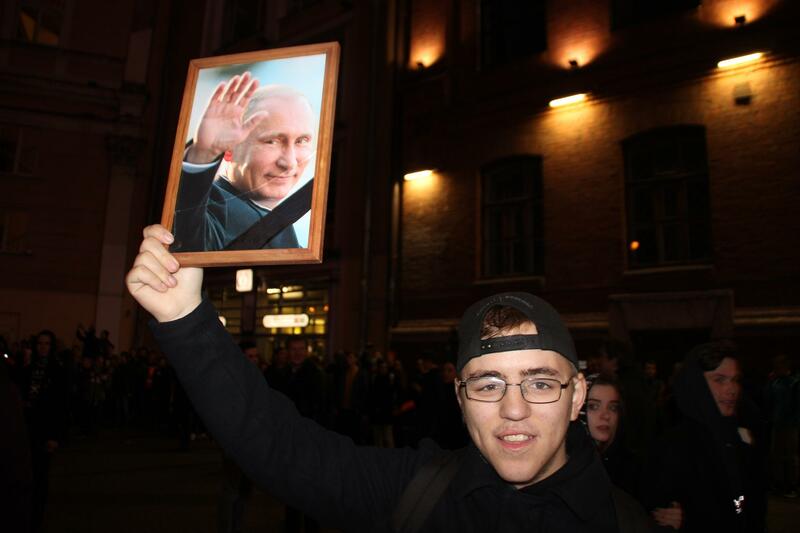 Protester holds photo of President Putin aloft outside Galereya shopping center. In Russian tradition, the black ribbon indicates the person in the picture has just died. 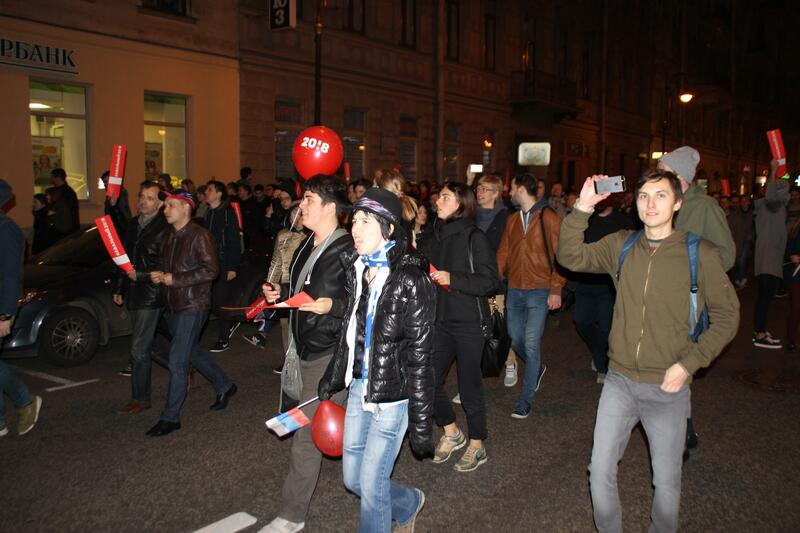 Alexei Navalny’s supporters held rallies in eighty Russian cities on October 7. Navalny himself was arrested in early October and sentenced to twenty days in jail for urging people to attending an unauthorized [sic] rally and meeting in Nizhny Novgorod.